"Chicago station" redirects here. For CTA stations, see Chicago (CTA). One of the two grand staircases, where famous movie scenes, such as in The Untouchables (1987), were filmed. 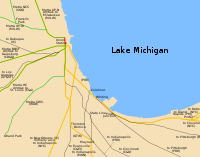 Union Station now serves as a terminal for all Amtrak trains to Chicago (orange), as well as a good number of Metra lines (green). Thin black lines represent former Amtrak routings. Chicago Union Station is a major railroad station that opened in 1925 in Chicago, Illinois, replacing an earlier station built in 1881. It is the only remaining intercity rail terminal in Chicago, and is the city's primary terminal for commuter trains. The station stands on the west side of the Chicago River between West Adams Street and West Jackson Boulevard, just outside the Chicago Loop. Including approach and storage tracks, it covers about nine and a half city blocks — mostly underground, buried beneath streets and skyscrapers. The station serves as Amtrak's flagship station in the Midwest, and is also the downtown terminus for six Metra commuter lines. Chicago Union Station is the fourth-busiest rail terminal in the United States, after Grand Central Terminal and Penn Station and Jamaica station in New York City. It is Amtrak's overall fourth-busiest station, and the busiest outside of its Northeast Corridor. It handles about 140,000 passengers on an average weekday (130,000 Metra riders and 10,000 Amtrak riders) and is one of Chicago's most iconic structures, reflecting the city's strong architectural heritage and historic achievements. It has Bedford limestone Beaux-Arts facades, massive Corinthian columns, marble floors, and a Great Hall, all highlighted by brass lamps. In 2011, its lighting system was replaced with more energy-efficient light bulbs and motion sensors, reducing the station's annual carbon emissions by 4 million tons. Custom steel lighting covers were added to top these safety/light towers, helping them blend in with the overall neoclassical style of the station. Chicago Union Station was designated as one of America's "Great Places" in 2012 by the American Planning Association (APA). The program recognized the station as a "Great Public Space" for promoting social activity and reflecting local culture and history. In celebration of the 2018 Illinois Bicentennial, Union Station was selected as one of the Illinois 200 Great Places  by the American Institute of Architects Illinois component (AIA Illinois). Union Station is laid out with a double stub-end configuration, with 10 tracks coming into the station from the north and 14 from the south. Unlike most of Amtrak's major stations, every train calling at Union Station either originates or terminates there; all passengers traveling through Chicago must change trains to reach their final destination. There are two through tracks to allow out-of-service equipment moves between the north and south side, including one with a platform to allow extra long trains to board. Between the north and south sides of the station is a passenger concourse. Passengers can walk through the concourse to get from any platform to any other without stairs or elevators. Odd-numbered platforms (1–19) are on the north half of the station, and even-numbered platforms (2–30) on the south half. The north tracks are used by Amtrak for the Hiawatha Service and the Empire Builder, and by Metra for the Milwaukee District West, Milwaukee District North, and North Central Service routes. The south tracks are used for all other services. Two station management structures (known as glasshouses), one on each side of the terminal, monitor train-to-track assignments and the flow of traffic in and out of the station. Actual oversight and control of switching and signalling is accomplished by two "train director" positions, one for each side of the station, located in the Amtrak control center in the station's headhouse. Inside the concourse are ticket counters for both Metra and Amtrak services, as well as three waiting rooms and a baggage claim for Amtrak passengers, a set of restrooms, and offices for Metra and Amtrak. The concourse also has a mezzanine level between platform and street level, containing a food court featuring local vendors as well as national chains. Located west of Canal Street, Union Station's headhouse occupies an entire city block. At its center is the Great Hall, a 110-foot (34 m)-high atrium capped by a large barrel-vaulted skylight. Arrayed around the Great Hall are numerous smaller spaces containing restaurants and services, and a wide passageway leading to the concourse. Above the headhouse are several floors of office space, currently used by Amtrak. Original plans called for many more floors of offices, forming a skyscraper above the Great Hall. This was never completed, although the plan has been revived in recent years. Numerous entrances provide access to Union Station's underground platform level. The main entrance is on Canal Street opposite the headhouse, but passengers can also reach the platforms directly from the headhouse via an underground passageway. Two secondary entrances are located in Riverside Plaza near the Jackson Boulevard and Adams Street bridges. On Madison Street, across the street, and one block east from Ogilvie Transportation Center, are a set of entrances to the north platforms. The current Union Station is the second by that name built in Chicago, and possibly the third rail station to occupy the site. The need for a single, centralized station was an important political topic in 19th and 20th-century Chicago, as various competing railroads had built a series of terminal stations. The numerous stations and associated railyards and tracks surrounded the city's central business district, the Loop, and threatened its expansion. The various stations also made travel difficult for through-travelers, many of whom had to make inconvenient, long, and unpleasant transfers from one station to another through the Loop. On December 25, 1858, the Pittsburgh, Fort Wayne and Chicago Railroad opened as far as Van Buren Street in Chicago. It built the first station at what would eventually become today's Union Station on the west bank of the Chicago River. The Michigan Central, which had previously been using the Illinois Central Railroad's Great Central Station, soon decided to back out of the agreement, and continued to use the Illinois Central Depot. The Chicago and North Western Railway, not part of the original agreement, considered switching to the new station from its Wells Street Station but deferred instead. In 1911 it built the Chicago and North Western Passenger Terminal for its operations. The remaining four original companies used the station when it opened in 1881. The headhouse of the Union Depot, a narrow building, fronted onto Canal Street and stretched from Madison Street to Adams Street. Tracks led into the station from the south, and platforms occupied a strip of land between the back of the headhouse and the bank of the Chicago River. South of the station, Adams, Jackson, and Van Buren Streets rose over the tracks and the river on bridges. Growth in passenger traffic, as well as a civic push to consolidate numerous railroad terminals, led to a proposal for an enlarged Union Station on the same site. The second Union Station would be built by the Chicago Union Station Company. This was a new company formed by all the railroads that had used the first station, save for the Chicago and Alton, which became a tenant in the new station. The architect was Daniel Burnham of Chicago, who died before its completion. The firm of Graham, Anderson, Probst and White completed the work to Burnham's designs. Work began on the massive project in 1913, and the station finally opened twelve years later on May 16, 1925; some viaduct work continued into 1927. The construction cost was projected to be $65 million, but ended up costing $75 million. Construction was delayed several times by World War I, labor shortages and strikes. The construction of the station also involved the demolition and relocation of some previously existing buildings such as the Butler Brother's Warehouse along the Chicago River. It is one of about a dozen monumental Beaux-Arts railroad stations that were among the most complicated architectural programs of the era called the "American Renaissance", combining traditional architecture with engineering technology, circulation patterning and urban planning. Union Station was hailed as an outstanding achievement in railroad facility planning. The station's ornate Beaux-Arts main waiting room, the "Great Hall", is one of the great interior public spaces in the United States. It has vaulted skylight, statuary, and connecting lobbies, staircases, and balconies. Enormous wooden benches were arranged in the room for travelers to wait for connections, and two specially-designed underground taxicab drives were built to protect travelers from the weather. The station featured a large, open concourse along the river, with massive steel arches holding up the roof, and several stairways leading passengers down to the platform. The large amount of land above the tracks and platforms has tempted property owners and developers. Possibly inspired by the "Terminal City" built atop New York's Grand Central Terminal, Chicago moved to develop the air rights above Union Station's tracks. The first building to be built was that of the Chicago Daily News in 1929. Designed in the Art Deco style, it was the first structure to add a public promenade along the river, which would be named "Riverside Plaza". Soon after, in 1932, the new Chicago Main Post Office opened. Also in the Art Deco style, it was a gigantic structure that occupied two full city blocks. The Great Depression and subsequent World War II halted development, but in the 1960s, work began on Gateway Center, a Modernist complex of five buildings. Only the first four were built, and construction lasted into the 1980s through several economic cycles. The 1925 dedication of the new station. Amtrak's Phase II Heritage P42 at track level, with Phase III NPCU 90368 on the opposite side. In 1990 the Morton International Building opened. Now named for Boeing, it is the tallest building yet to be constructed over the tracks. It received awards for its innovative engineering. With the construction of River Point beginning in 2013 and 150 North Riverside beginning in 2014, the entire length of the tracks from Union Station north to Fulton Street and south to Polk Street is enclosed by overhead development. During World War II, Union Station was at its busiest, handling as many as 300 trains and 100,000 passengers daily, many of them soldiers. Illustrator Norman Rockwell captured this era with his cover painting for a December 1944 issue of The Saturday Evening Post, depicting the station jammed with Christmas travelers. After the war, the growth of highway construction and private ownership of automobiles caused a severe decline in American passenger-rail ridership, including at Union Station. In 1969, the expansive Beaux-Arts concourse at Union Station was demolished to make way for a modern office tower. A new, modernized (but smaller) concourse was constructed beneath the tower. In 1970, Amtrak was formed. In 1984, it bought out the shares of Chicago Union Station Company held by Burlington Northern (successor to the Burlington Route) and the Milwaukee Road, becoming sole owner of the station. In 1991, Lucien Lagrange Associates renovated the concourse, including the Great Hall and its skylight, which had been blacked-out since World War II. Restoration of Union Station continues. Numerous spaces within the station have yet to be renovated, and many sit unused, especially within the headhouse. After the September 11 attacks, Amtrak closed the pair of taxicab drives in the name of security. Passenger traffic has increased and is exceeding the design capacity of 1991 renovation. The planned high-speed trains of the proposed Chicago Hub Network are expected to further boost traffic, and numerous improvements have been planned to accommodate it. In 2010, Amtrak (the current owners of the Chicago Union Station Company) announced plans to air-condition the Great Hall for the first time since the 1960s. That year a Chicago Tribune investigation revealed high levels of diesel soot on the underground platforms of Union Station. Metra established an "Emissions Task Force" to study this problem and recommend solutions to improve air quality in the underground areas. Union Station remains a busy place: in 2016, about 120,000 people used the station each day, up from 54,000 people in 2007. Of those passengers, 90% ride the Metra commuter rail lines. Union Station currently serves more than 300 trains per day: all Amtrak intercity trains to Chicago as well as five Metra commuter rail lines. In June 2015, Amtrak announced that it would renovate the station, including opening up long-closed spaces and replacing the worn staircases with marble from the original quarry near Rome. In 2018, restoration of the Great Hall, including restoring original detailing and rebuilding the large skylight was completed, increasing natural light by 50-60%. Union Station was served by lines in all directions even before Penn Central and Amtrak consolidated the downtown terminals. Some of these trains and their names have survived to present Amtrak services, such as the Empire Builder, the California Zephyr, and the Hiawatha. The name Ann Rutledge was used by Amtrak as a Chicago-St. Louis-Kansas City route until a name and service consolidation in 2009. There is also a Lincoln Service that operates in Illinois. See also: Ann Rutledge; Illinois Service; Missouri Service. Unlike other major American intercity/commuter rail hubs – such as Grand Central Terminal and Penn Station in New York, 30th Street Station in Philadelphia, South Station in Boston, and Union Station in Los Angeles – Union Station does not have any direct connection to local rapid transit service. However, there are several rapid transit stations within walking distance of Union Station. Metra's other three downtown terminals–the Ogilvie Transportation Center (formerly North Western Station), LaSalle Street Station and Millennium Station (formerly Randolph Street Terminal)–are all within a short walking distance of Union Station. As mentioned above, passengers connecting from Ogilvie can access Union Station's north platforms on the opposite side of Madison Street. Numerous local bus lines stop directly at Union Station. A public meeting was held in December 2011 to discuss the future goals and designs of Union Station, with ideas being exchanged on how the station can accommodate the expected 40 percent growth in passengers by 2040. The results of this dialogue were incorporated into the May 2012 Chicago Union Station Master Plan Study. The study, led by the Chicago Department of Transportation (CDOT), in collaboration of Amtrak (station owner), Metra (station's primary tenant), and other local and federal organizations, calls for increasing the station's capacity and quality of service. According to the City of Chicago's website on the study, short-term improvements call for improving station entrances and expanding waiting rooms, as well as enhancing bus lanes on Clinton and Canal Streets and creating a bus terminal on Jackson Boulevard between Canal and Clinton. For the medium-term (5- to 10-year horizon), ideas include widening commuter platforms, using unutilized mail platforms (including an extra-long through platform) for intercity passenger trains, adding more through tracks and platforms, reorganizing facilities for better capacity and flow, increasing height clearances of the tracks, and improving street access to and from the station. Long-term, proposals include increasing capacity and improving the ambiance of the station by significantly expanding or replacing station facilities in the 200 or 300 blocks of South Canal Street. Adding track and platform capacity along Clinton Street or Canal Street are also analyzed. In September 2016, a Chicago Transit Authority bus transit center opened adjacent to the Union Station parking garage, and bordered by Canal to the east, Clinton to the west, and Jackson to the north. The new off-street bus transit center serves CTA buses. The center is on land that had been occupied by a surface parking lot. It features an elevator and stairway to the Amtrak underground pedestrian tunnel, allowing commuters to pass between Union Station and the bus staging area without crossing at street level. ^ "Chicago Union Station Facts". Chicago Union Station. Amtrak Media Relations. 2015. Retrieved March 29, 2015. ^ "Filming locations for The Untouchables (1987)". IMDb.com. Internet Movie Database. ^ a b "Chicago Union Station Master Plan Study Completed" (Press release). City of Chicago. May 23, 2012. Retrieved February 11, 2013. ^ a b c d "2012 Great Public Spaces". Great Places in America: Public Spaces. American Planning Association. Retrieved February 11, 2013. ^ Company, Helander Metal Spinning. "Our Blog | Union Station". blog.helandermetal.com. Retrieved June 25, 2018. ^ American Planning Association. "Great Places in America". Community Outreach. Retrieved February 11, 2013. ^ Condit, Carl W. (1973). Chicago 1910–29, Building, Planning, and Urban Technology. The University of Chicago Press. pp. 273, 279, 297. ISBN 0-226-11456-2. LCCN 72-94791. ^ Mayer, Harold M. (January 1945). "The Railway Terminal Problem of Central Chicago". Economic Geography. 21 (1): 62–76. doi:10.2307/141384. ^ Map of the Central Portion of Chicago, 1895 (Map). Rand, McNally & Co. § B5. Retrieved January 16, 2011. ^ "Chicago Union Station :: Station Facts". www.chicagounionstation.com. Retrieved June 25, 2018. ^ "Annual Excellence in Structural Engineering Design Competition" (PDF). Structural Engineers Association of Illinois. Archived from the original (PDF) on December 7, 2010. Retrieved January 16, 2011. ^ Kamin, Blair (December 16, 2016). "Curvy new skyscraper reflects river and rising design ambition". Chicago Tribune. ^ "River Point Tower, Chicago, IL". mka.com. Magnusson Klemencic Associates. Retrieved September 28, 2017. ^ Yona, Batel (May 12, 2017). "River Point-2017 Global Awards for Excellence Finalist". Urban Land Institute. ^ Kamin, Blair (April 20, 2017). "Review: 150 North Riverside is most eye-grabbing Chicago skyscraper since Aqua Tower". Chicago Tribune. ^ LaTrace, AJ (April 28, 2017). "150 North Riverside claims its place in Chicago's skyline: The finely tuned office tower carries Chicago's architectural legacy into the 21st century". Curbed Chicago. ^ Nilsson, Jeff (December 19, 2016). "Crowd-sourced: Norman Rockwell's Christmas at Chicago Union Station". The Saturday Evening Post. Retrieved March 7, 2019. ^ Amtrak Media Relations (2017). "Chicago Union Station Facts". Chicago Union Station. Retrieved September 28, 2017. ^ "Chicago Union Station". Metra. Archived from the original on June 14, 2011. Retrieved June 23, 2010. ^ HDR/CANAC (2002). Chicago Union Station Capacity Study (Report). Amtrak/Metra. Retrieved January 16, 2011. ^ "Major Makeover Coming for Union Station". CBS Chicago. October 5, 2010. Retrieved January 16, 2011. ^ Hawthorne, Michael (November 5, 2010). "Metra Riders Subjected to High Amounts of Diesel Soot". Chicago Tribune. Retrieved January 16, 2011. ^ "Metra convenes task force to improve air quality" (Press release). Metra. November 9, 2010. Archived from the original on November 17, 2010. Retrieved January 18, 2011. ^ a b Division of Strategic Capital Planning (July 2016), State of the System: 2016 (PDF), Metra, p. 32, In terms of passenger volume, CUS [Chicago Union Station] is the largest Metra station downtown (and in the Metra system as a whole), accounting for 46% of alightings at the five CBD stations. It is the nation's third-busiest passenger railroad terminal, serving over 300 Metra and Amtrak trains each weekday. Ninety percent of the 120,000 people passing through the station each day are Metra riders. CUS serves six Metra lines—the Milwaukee District North and West Lines, the North Central Service, the Heritage Corridor, the SouthWest Service and the BNSF Line. CUS provides convenient access to the West Loop office market that has developed west of the Chicago River and east of the Kennedy Expressway; it is served by 13 Chicago Transit Authority (CTA) bus routes, the CTA Blue Line at Clinton Street, Chicago River water taxis, private shuttle buses, and intercity buses. ^ Hilkevitch, Jon (June 29, 2015). "Amtrak plans Union Station makeover". Chicago Tribune. Retrieved June 30, 2015. ^ Wisniewski, Mary (November 30, 2018). "Union Station's Great Hall is bright for holidays, after skylight repair". Chicago Tribune. Retrieved December 14, 2018. ^ "Union Station transit center work to impact West Loop traffic". Chicago Tribune. May 6, 2015. Retrieved June 21, 2015. ^ Shelton, LeeAnn (May 6, 2015). "Lane closures start Friday for new Union Station Transit Center". Chicago Sun-Times. Retrieved June 21, 2015. 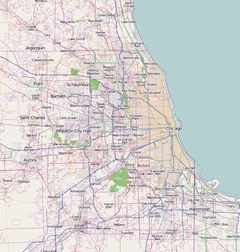 Wikimedia Commons has media related to Union Station (Chicago). Historic American Engineering Record (HAER) No. IL-63, "Union Station"
This page was last edited on 22 April 2019, at 00:15 (UTC).